Smoking causes stroke, coronary artery disease and lung cancer. Clove cigarettes are made of tobacco and cloves. Bidis' are flavored, unfiltered cigarettes that are quite popular in rural areas. We all know how tobacco and cigarettes affect one's health and the nicotine content present in them is known to make people addictive. The most common dangers associated with cigarette smoking include an increased risk of stroke, coronary artery disease and various lung diseases including cancer. People often switch to herbal and natural cigarettes considering them healthier than the regular cigarettes, but what they don’t realize that these natural and herbal cigarettes can have their own risk on the health. Listing some of the dangers of smoking herbal cigarettes you were not aware of. You will be shocked to hear that herbal cigarettes are as harmful as tobacco cigarettes, because herbal matter too produces tar, carbon monoxide and other harmful toxins on burning. Inhaling smoke of herbal cigarettes causes harmful toxins to enter directly into your lungs through breathing. As per The Federal Trade Commission, all herbal cigarettes are required to have statutory warning that says smoking herbal cigarettes is harmful to your health. Common herbs used in the herbal cigarettes include passion flower, corn silk, rose petals, lotus leaf, licorice root, jasmine, ginseng and red clover flowers. Clove cigarettes, also known by the name of kreteks, are made of tobacco and cloves, usually 60 to 70 percent tobacco and 30 to 40 percent cloves. But they also contain a good amount of clove oil and other additives. According to researches, these alternative cigarettes are actually of inferior quality than those regular tobacco products, delivering more nicotine, carbon monoxide, and tar to smokers, thereby, causing more damage. As far bidis concerned, they are flavored, unfiltered cigarettes that are quite popular in rural areas. 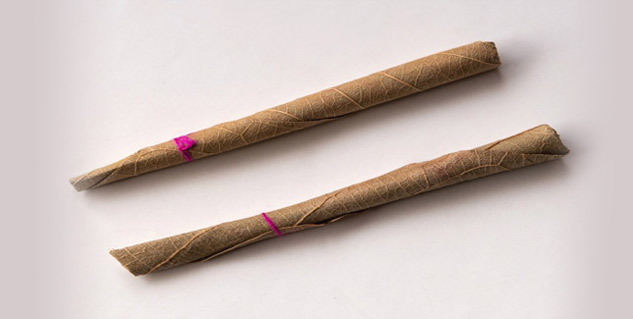 They are thinner and smaller than regular tobacco cigarettes, and come hand-rolled and Piliostigma racemosum leaf tied with on each end. Besides, they tend to be cheaper than traditional cigarettes. While bidis are known to contain less tobacco than normal cigarettes, but they have been shown to deliver more nicotine.